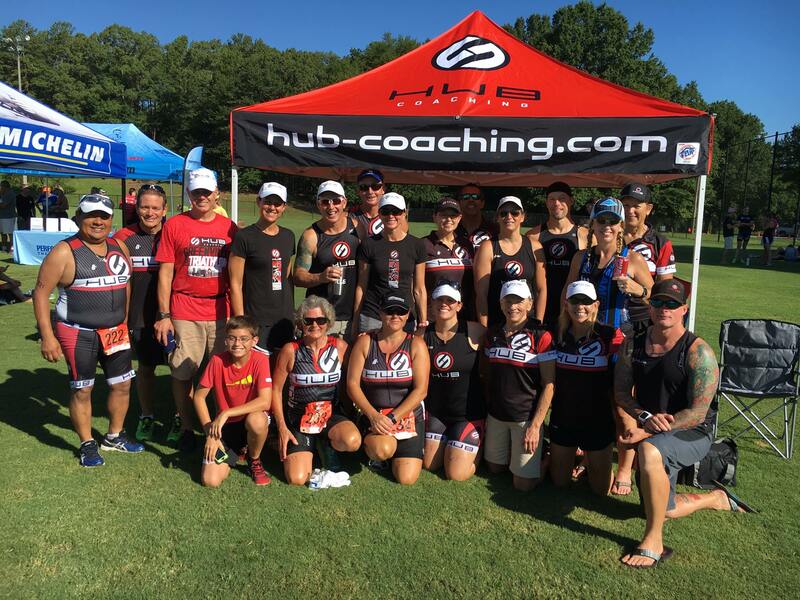 HUB Coaching is a triathlon coaching business and boasts having the only true triathlon team in the Greenville and Columbia S.C. area. With us you get the benefits of a triathlon team whether you are coached individually by one of our coaches or whether you want solely a team experience. Our coached athletes and team members are made up of triathletes of all abilities, ages and experience. We consist of everyone from the finish line chaser to the World Champion qualifier. Our Coaches all have a passion for motivating others and clearing our athletes and team members mind of the word cannot. With years of experience competing in all distances of triathlon, HUB Coaches know the importance of avoiding injury and maximizing your gains in order to be as competitive as possible. Therefore we apply a purposeful and personal training approach to each workout we write for our athletes. In order to provide each athlete with the attention they deserve and pay for we keep Coach/Athlete ratios very low. You will find no cookie cutter training workouts with HUB. Whether you are just starting out or trying to set a personal best, we believe in the transformative power of having a coach that can help guide you to reach your full potential. Jennifer Arends, Founder and Head Coach of HUB Coaching, spent many years coaching and helping friends reach their running and triathlon goals. In 2014, Jennifer finally took the plunge and turned her love of all things fitness, running and triathlon into a full time job and created HUB Fitness and Coaching. In 2016 she sold HUB Fitness and began focusing all of her attention on HUB Coaching. 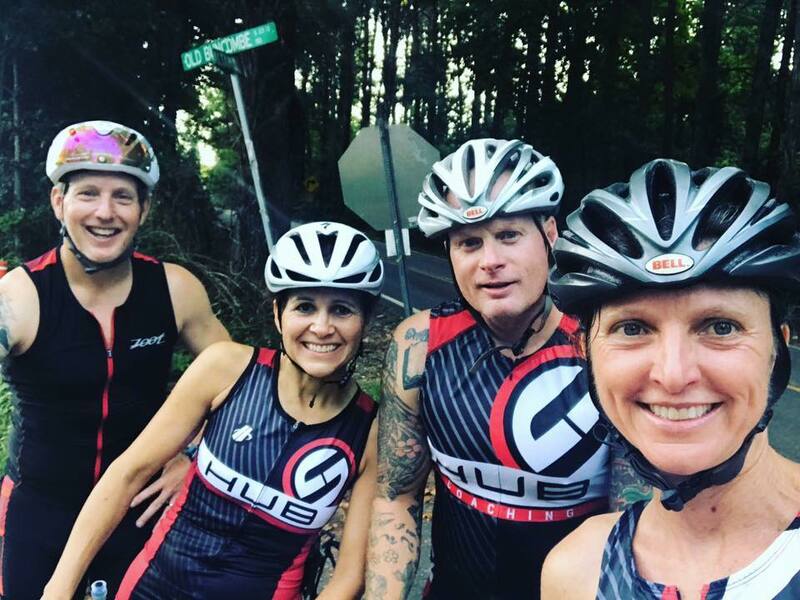 After years of seeing a lack of camaraderie, fun and team atmosphere in the Greenville tri community, Jennifer immediately created Team HUB. Within 2 months the team grew from 0-25 members proving that triathletes in the Greenville tri community were seeking more than just triathlon coaching but somewhere they could feel comfortable and accepted no matter what their goals or level of fitness. Today you cannot go to a local race without seeing HUB Athletes. Learn more about our coaching services, coaches, and Team HUB by exploring the rest of our website or contacting us personally. One-on-one time with our coaches are essential and we make sure to schedule those into the training plan.A lot of training programs are a cookie cutter model of training. We focus on coaching and personalized attention, instead of a one-size-fits all approach. Using a company that gives you a plan that isn't customized for you will mean minimal gains. By using our one-on-one training you know that you will get the best coaching and attention needed to exceed your goals. You receive a personalized plan with constant check-ins and availability from the coaches. Part of our personalized planning process includes benchmarking using state of the art software that allows both you and your trainer to have access to your training data. We set benchmarks at the beginning and monitor progress using our software to give us pinpoint precision and accuracy in your training schedule.The data that we compile from your training can be synced across your devices for easy access on training days and makes for a scientific approach to coaching. Hub Coaching is a team of coaches with the experience and drive to help you with your goals! Our coaches have years of experience winning and competing in triathlons, Ironman’s and other long distance events. Having an experienced coach is essential to avoiding injury and maximizing your gains in order to be as competitive as possible. We love working with very competitive athletes focused on winning events and athletes with personal achievement goals. We accept a limited number of athletes in order to provide each of our athletes with the quality time they each need and deserve. Most coaches take on a large number of athletes which results in a cookie-cutter approach to training plans. We believe no two athletes are alike and in order to maximize each athletes potential we focus on providing quality of service not quantity of athletes. You will love the incredible software we use to track your results and measure success. We use the best triathlon training software to give you a leg-up in training. Have You Hit A Plateau In Your Training? It's Time To Discover Your Potential. HUB Coaching is a running and triathlon coaching service that is personalized to your running and triathlon goals. When it comes to coaching, we believe in quality over quantity. That means we only take a small number of athletes at one time. And that's good news for you and bad news for anyone you're competing against. Whether you are just starting out or trying to set a personal best, we believe in the transformative power of having a coach that can help guide you to reach your full potential. If competing and performing better in your races excites and motivates you, give us a call today for a free consultation. Fill out the form below to schedule a one on one, no strings attached consultation at no cost to you that will allow you to see our approach, and allow us to see what type of success you should expect to see while hitting your goals. Please describe your experience level with triathlons and running. We can help all levels of athletes. Jennifer Arends has a passion for the sport of triathlon that I have not seen in others. Her excitement for the sport and encouraging words brought together a group of athletes, new and seasoned to the HUB team. Her desire to see us succeed and progress as athletes is always top priority, but so is having fun with the drills, team rides and races. Prior to meeting Jennifer, I assumed that coaches were meant for top athletes. I felt I needed to learn to run on my own before signing up for speed drills and long distances. I was hesitant to get a coach for fear that I would not be at a level a coach would be willing to work with. More importantly, running wasn’t fun enough for me to push to become better. Jennifer creates fun and challenging workouts to help increase my endurance and speed. Each workout is unique and created especially with me in mind. She takes my comments into consideration when I really enjoyed a specific work and will incorporate it again. I have had significant gains since starting with Jennifer. She has shaved 2:30 min off my mile running pace. In the sprint triathlon, Jennifer took me from the middle of my age group to podium standings for the season. With 70.3 distance triathlons, she shaved an hour off my time, dropping me below the 6-hour mark. What sets Jennifer apart from other coaches, is that she celebrates these gains with her athletes. She is there on the challenging days, pushing me along in the rain and cold. She is there for the race days and podium celebrations. Not always in person, but always there in spirit. I could count on her to call or message me before and after a race. Ready to encourage and help set my mind for the race as well as updates on how I felt after it was over. Helping other athletes is her passion. Coach Jennifer’s individualized training plan enabled me to complete my first Ironman on September 24th, 2017 in 11 hours 44 minutes with virtually no prior triathlon experience. At 57 years of age Jennifer’s coaching was instrumental in ensuring that I trained at a pace that prevented injury while maximizing my potential. 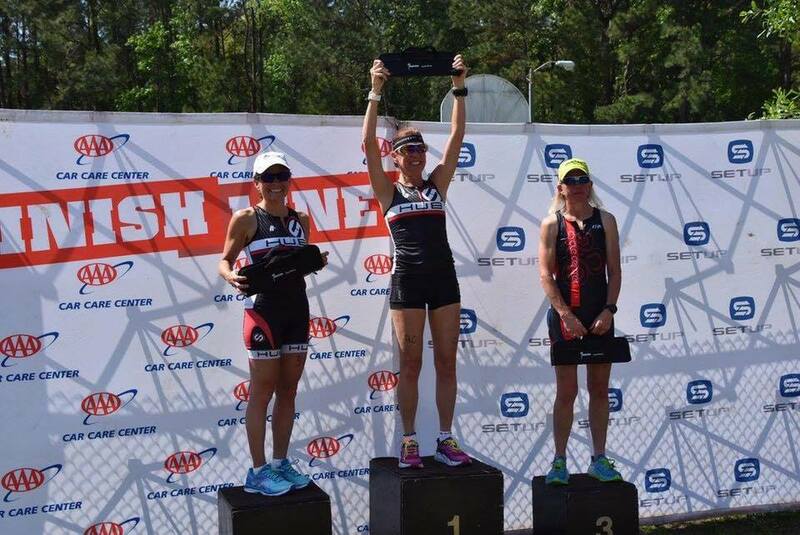 Coach Jennifer put together a fantastic training plan that provided a solid building block approach resulting in a great race finish! I highly recommend Jennifer to anyone looking for a Tri Coach. By the way, she kept it fun as well! My experience working with Coach Arends at Hub Coaching was awesome! I have had coaches in the past and none of them provide the in-depth analysis and attention to detail like Jennifer. All workouts had an intended purpose and tailored specifically for me. No cookie cutter workouts like you see with some coaches. Jennifer is also very diligent communicating with those she coaches and does as many hands on coaching sessions as she can. In terms of my Ironman, my swim time decreased by 45 minutes due to Coach Arends coaching and guidance. My run times also decreased. Even as a 40 year old seasoned triathlete, all my times improved . If I had followed the nutritional plan she laid out for me, there is no reason not to think I would have had a huge PR at Ironman Chattanooga. I highly recommend anyone from 5ker’s to Ironman athletes who are looking to improve their fitness or racing goals to hire Coach Arends. You will not be Disappointed!